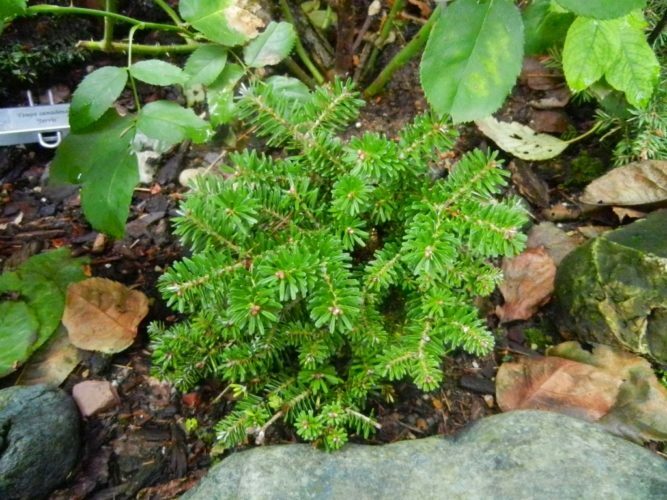 Abies koreana 'Pinocchio' is a nice, dwarf rounded bush form of Korean fir. Foliage is a nice bluish-green and annual growth is around 1 - 1.5 inches (2.5 - 3.5 cm) per year. After 10 years the gardener can expect a ball of needles 12 x 12 inches (30 x 30 cm) tall and wide. Another of the small, bun-shaped forms of Korean fir. It grows slower than 'Silber Mavers' but faster than 'Silberkugel'. Edwin Carstens Nursery of Varel Germany introduced 'Pinocchio' in the early 1980s the original propagation material came from a witch's broom. It is a excellent selection for the small garden, rockery or trough. This young specimen(5 years old) is growing at Hobbiton Gardens, Port Orchard, Washington.